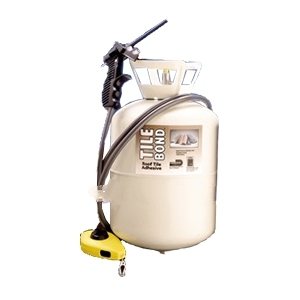 PRODUCT: Dow #157849/308276, TILE BOND™ Tank Kit. 23 Lbs of Adhesive together with hose, dispenser, coupler, valve, wrench and instructions. Large size for new roofing and large repairs. Price/Kit. Ground shipment only. Not air ship-able. No express shipping. 3-4 business day shipping lead time. Shipping weight ~31-lbs/kit. APPLICATION: Provides about 550-640 lineal feet of adhesive. Use together with #157957 TANK only for bigger jobs. Use 3-4 # 157957 tanks with each # 157849 Tank Kit. A convenient to use single-component aerosol dispensed polyurethane adhesive for attachment of concrete and clay roof tiles. TILE BOND adhesive is approved for installation of most low/flat, medium, high and two-piece barrel (cap and pan) profiles of roof tile in new and re-roof applications. Can also be use to create walk-paths on roofs. TILE BOND provides great attachment strength, minimizes nail penetrations, reduces roof weight loads. Enables creation of walk paths by using under all tiles to be walked upon to service roof top equipment. Superior dispensing equipment supplies the adhesives in a highly consistent manner. Cures in less than an hour in most weather conditions. PACKAGING: Also available in tanks with 23lbs of adhesive for larger jobs. (includes details of underlayment system. * Tile installation for 140 MPH (page 8).